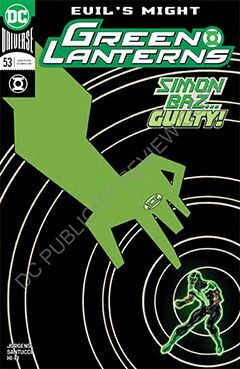 Simon Baz is being hoodwinked, at the expense of his fellow GLs. He is convinced to abandon them in midst of their battle with the Ravagers. Simon is led to believe the real threat lies back on Earth, and heads off unexpectedly. Unfortunately, this only adds to the circumstantial evidence against him. Hal, John, and the others have reason to believe Simon has turned on the Corps – a dead Guardian, their home planet in turmoil, and the intrusion of the Ravagers. But the Corps has other issues to deal with, not the least of which is the genocide of an entire planet. Simon’s bogus solution is on Earth, but it may actually be the bigger threat the Green Lanterns are fighting against. This development was rather surprising and unexpected. No doubt we’ll learn more next issue. I’m pleased Marco Santucci continues to illustrate the book. I hope he sticks around, if not on Green Lanterns, maybe elsewhere in the DCU. I suspect he might do well on JLA or Flash. Mike Perkins’ cover, on the other hand, is a bit lacking. It looks cobbled together as an after thought.